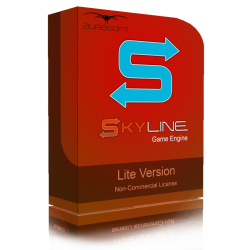 Today, we are releasing a new version of skyline with version v1.0.1.3. It contains many fixes and improvements to some major problems that have been located and fixed and this update will hopefully span the gap between the this version and the new vegetation system and new mechanics. We have released it all as full installs for all versions including the Lite version. There is also Auto updates available which are only possible on the Pro and Studio Pro versions. 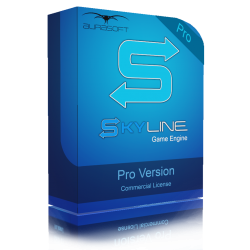 If you need to download the new version of skyline, then go to your downloads and click the blue download icon to the side of your Skyline Download. This can all be done from "My Account" button after logging in. Seeing how skyline now uses the System Library and your user libraries being seperate, we don't need to tell you to backup your libraries anymore. However, if you have placed anything in the System Library, then do make sure to back that up and move it to your Custom User library as the System Library should not be used to store your files. Only preinstalled content only. New: Lua: JSON Dump command will now create the directory if it does not exist already. New: Splashscreen - Progress bar showing percentage of loading operation. Updated: Projects that were isolated and then add a user library that was disabled would add the library into resources which could break things sinc e its isolated. Updated: lua: sky.getDir_AssetLibraryOrGameFolder() in end game did not return a slash but it does in the editor, now it is the same and both editor and game return this function with a slash on the end. Updated: JSON Load / Dump in Lua now works with the resource system. Updated: Loading resource lists are now 10x faster and can load 16million resource lines in 58secs instead of 834 seconds on an i7 3770 and 7200rpm HDD. Updated: Writing the resource lists is now 5% faster than the previous version. Updated: Resource lists use half the ram, it was being doubled by copying the table into an array which was a waste. Now all the resource lists are pointers and use the same memory location for accessing. Updated: We now use a background thread to check the resource lists when skyline boots up for files that may not exist anymore and rewrite the resource lists if they are different. Fixed: When loading skyline, it kept reference and tried to load all the older non existant projects which resulting in an ever growing list. Fixed: Projects: Start screen will now remove recent projects that are not existing or bad name from the registry. Fixed: Audio: If more than 512 sounds were created at the same time, it would crash due to a hard coded limit on the audio creation pool. Fixed: Dragging a texture not from the Heightmaps folder onto the terrain would give PBR or Unlit box. When pressing ok it would crash because there is no mehs target to apply the material too. Fixed: Changing the mesh of a static entity from the entity properties would crash due to a dynamic mesh being applied to the static node. Fixed: Multi select and rotating with the gizmo would not write the positions back, but would keep the last rotations, then when loading the scene, entities would not be in the correct place. Fixed: Multi select and scaling with the gizmo would not write the positions back, but would keep the last rotations, then when loading the scene, entities would not be in the correct place. Fixed: Material Editor: Saving as would take you to the Win32 or 64 folder instead of the user library directory. Fixed: Mesh Editor: There was a missing material on the sphere large. Fixed: Saving scenes: When saving a new scene that loaded from the start screen templates, it would open the dialog to the templates folder and not your user library.